Every soul that has a car with no garage to park knows the struggle of leaving it at the mercy of the outdoor elements. Leaving a car unsheltered leaves you with the risk of the paint fading, of it getting wet, or being damaged by the hail. This can ruin the beautiful furnish of your vehicle and lead it to costly repairs, the beast. A carport can be a great addition to your home. Alongside it being handy and functional, you can have it built custom made and add the aesthetic value to your home too. The fundamental reason of a carport, as we mentioned earlier, is to keep your car safe from the harsh weather and cut down on the risks of spending on repairs. It can protect your vehicle’s exterior from sunspots, bird droppings, and storm damage. It can also protect the sun from shining through the windows and fading the interior fabric. If building a garage for your car is too expensive for you at the moment, carport is definitely the way to go. By installing a carport you will lower down the expense, at the same time cut down on the risks of your car being damaged. You can choose between prefab carports, DIY carports, or have it fully installed. Carport can be fully erected in a few hours or a couple of days at most, which means you will not have to wait for having a safe place for your vehicle much. You might be thinking how a carport can be multifunctional when its primary application is to provide shade for the car. Well, you’d be surprised to know that they can be used for bunch of other things too. For example, if you have friends coming over to your house, you can simply move the car for a while and have a covered space capable of fitting a few people comfortably. 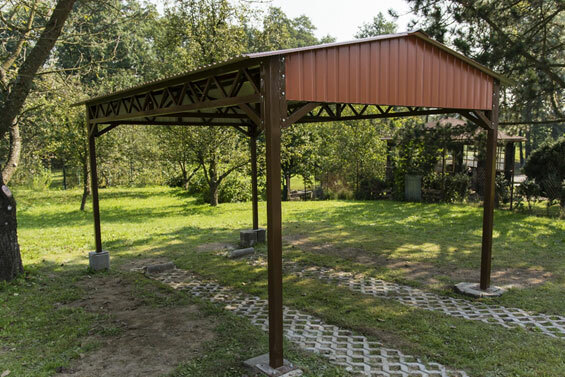 You have the option of attaching the carport to your home, or leave it freestanding. If you have it adjacent to your home, you can do the unloading of groceries comfortably. Also, when your vehicle is out, your kids, if you have any, will have a nice space to play too. Aside from its functionality, a well-designed and carefully built carports can add significant value to your property. Just to let you know, if you have possibility of putting up your house in the market to sell, these structures lure potential buyers who are particularly fond of their vehicles and want extra protection during the harsh weather. You don’t have to go with boring flat roof, four poles carport while building your carport. There are options for you to choose from. You can have it custom-made with your design ideas. Carports can have curved roofs or gabled or multi-gabled roofs. You can choose a design that matches your existing home structure so it doesn’t look out of place. You can choose metal, timber or other roofing options as the building material. Simply tell your builders what you want and take the hassle off your shoulder. MTB Carpentry and Constructions is experienced in projects like this and can build your carport just as you wanted. Visit them if you want to build a carport best suited to your vehicle and to your home. Kitchen remodelling: DIY or Professional?